Get Your Team Growing Their List, Making Easy Approaches that Get Prospects Watching a Presentation and Joining Your Team. Have over 100 Members in Your Orginization? Book a Free Consultation with an Expert to See How a Custom System Can Pay for Itself. "Okay, I have looked at a lot of programs out there that will help me create the efficiency that I need. Let's face it we lose people if we don't have a system. This is the only program that I have found when I leave a message and choose an outcome the email that goes out is like Magic! Some of the people email me back! It follows up with people so you don't have to! No brainer. And the cost....come on....it's equivalent to 4 cups of Starbucks coffee. No brainer. " "I have looked at several office assistant programs to help manage my business more effectively and to improve time management. I also needed a tool that was simple and easy to use for follow up, timely communications, a group email or communication system that didn't get lost in the junk mail or filtering systems of the ISPs. Plus, if I could really complete my with list, I needed a simple system that my team could use everyday to run their business. 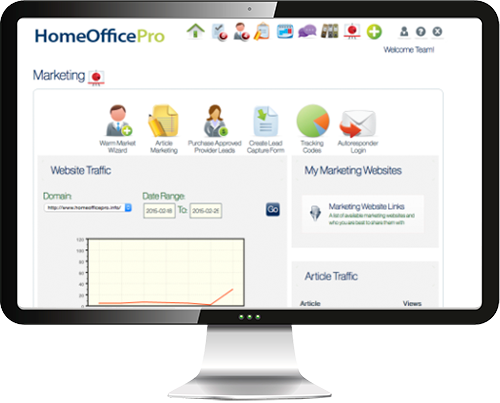 Platinum Synergy's Home Office Pro has it all and more.". 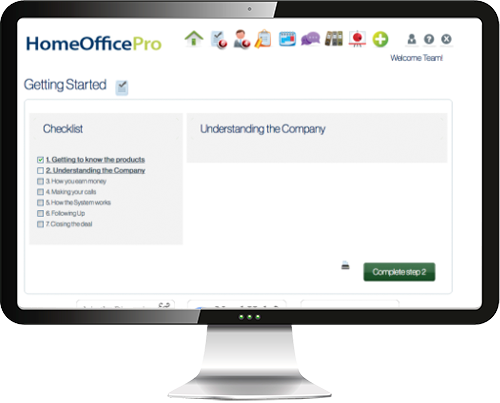 Home Office Pro has been an incredible addition to my business. It's allowed our organization to be far more organied and to use our teim more efficiently. It truly is the best tool we have to train, to market and to keep in touch with our members as well as our contacts. I can't imagine our business without it! Have a 100 or more team members? Learn how a custom solution can pay for itself. Book a Free Consultation with an Expert Today. Get leads by sharing weekly professional & original articles right to your social media accounts that inspire prospects to learn about your business opportunity, watch your business presentation and signup for your company. Get push notifications when there are new original articles to share, when you receive a new prospect or when a prospect is watching your business presentation. Need to set an appointment with a contact? The mobile app will automatically add those appointments to the calendar on your mobile phone. 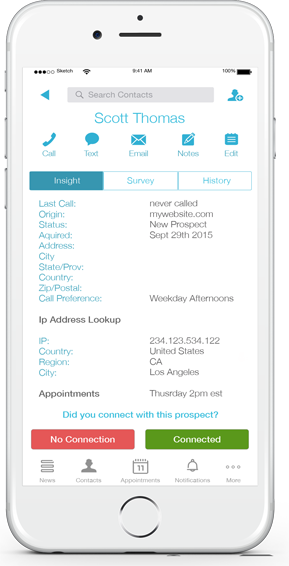 Call, text, make notes and email pre-written templates responses to prospects with the touch of a finger. Help new business partners instantly create a list of friends to approach from the contacts already on their phone. Easily customize a getting started checklist for new team members. Upload documents, audios and videos for team members to access right inside the software. Make it easy for your team to create an organized list of people they know by importing their mobile phone, computer email, web email and LinkedIn contacts. Build your team beautiful and effective lead capture pages instantly branded to each user on your team. Run your own advertising campaigns, track the return on investment while making those new leads available to the team members who participate. Don't want to run your own advertising coop? 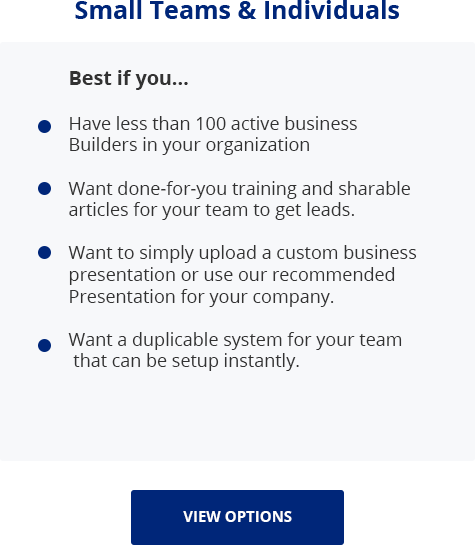 No Problem we run it for you and deliver the leads to your team on demand. Don't distract your team with blogging. Publish articles to a blog that are available to your entire team to share so they just share articles and get the leads. Get content from selected authors and in return they get leads from their articles ranking in the search engines. The digital active candidate list for your team is smart because it works with the website to notify you when contacts hit key pages or links, updates your contacts history for you and moves contacts to different statuses so your team is always calling the best prospects first. Record a business presentation once, and deliver it in a live simulated event or video an unlimited amount of times. Allow users to schedule follow-up appointments and sync those appointments with their calendar on their cell phone so they never miss an appointment or double book. Allow your team to book prospects to live presentations with one click from their contact manager. Easily upload and create training programs with documents, audios and videos for your team and and make them organized for your team to learn and grow. Promote events and keep your members attending your training calls by providing a centralized team calendar. As members register for your team system it will automatically build you a team email list so you can send email updates to your entire team. Track opens, click and segment the list for targeting. We not only create your team marketing websites so they can collect leads, but we automate the follow-up emails and the complete follow-up process in our easy-to-use Contact Management System. Never miss a presentation or forget a follow up. From the built in calendar that confirms your appointments to the ability to sync the calendar to your mobile phone, we make successful scheduling easy and organized. Get them started the right way every time. Our simple to follow getting started process will allow you to pre-determine the training steps for each new member so they get started the right way every time. Avoid the pitfalls with blogging. Allow members to simply share articles to generate leads from a controlled approved content stream. The system will act as a home base for your team, allowing you to post and broadcast news, team trainings, presentations, webinars, documents, audios, videos and more with very little effort. Book a Consultation with an Expert to See if a Custom System is Right for You and Your Organization.